Rudy’s been battling a lot of congestion this week. 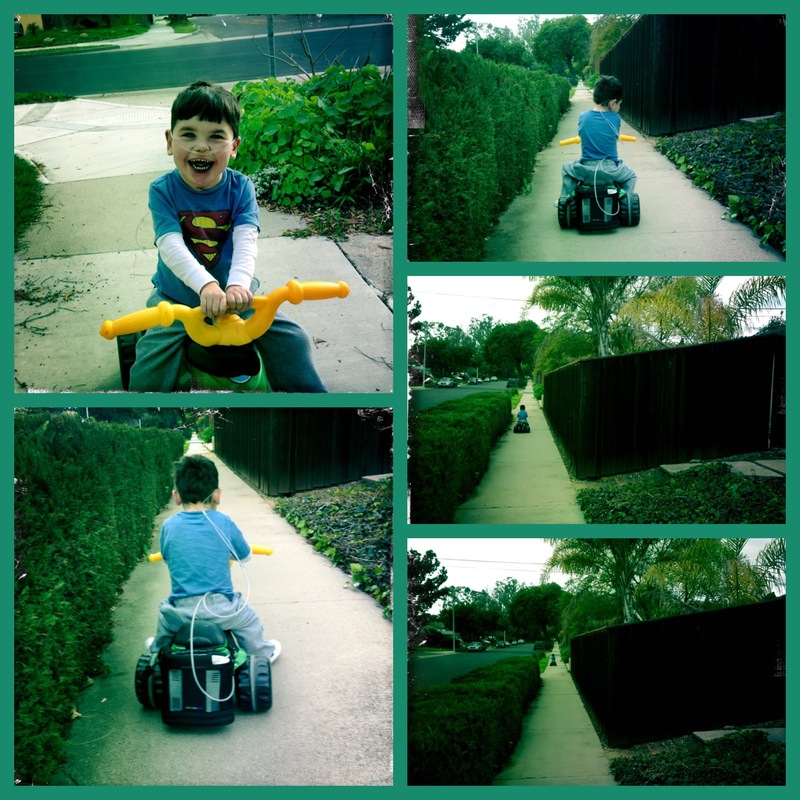 As he seemed chipper, I rigged the Inogen to his bike and let him get some fresh air. Once he saw daylight, he took advantage of having no strings attached and went off to explore the neighborhood. Despite how much he huffed and puffed, every time I tried to point him home he gave me an emphatic “NO, DADDY!” and headed in the opposite direction. After 90 minutes, he exerted himself to a bloody nose and and still protested vehemently when I finally brought the excursion to the end. Cute, tough, tenacious little warrior. He’ll be riding to the beach before we know it. Gotta love that little fighter! Go Rudy Go! Love you little tough guy — next trip to pick Olivia up at school. You said it!!!!! Rudy, you rock! So fun!!! Bring him along to us! Oh this is precious! You GO Rudy! I’m sure you love being out there on your “bike” just like your big sibs! We love you all! What a wonderful spirit he has! How wonderful to see him enjoying his independence! Gotta love that boy and patient Daddy! Awesome! Our little miracle bundle is determined! I praise God for the awsome inovations helping Rudy and others. Note: tape the O tube up so it doesn’t get caught in the wheels and the frequency of nose bleeds will lessen. Just saying. What a joy he is. I really enjoyed the transcript of your journey to Disney. I’m not sure what to say, but the day after I read the story, the hymns at mass had greater meaning. I love Rudy and you two parents are the best, but his brothers and sister are everything I have ever experienced in a sibling. So glad, Rudy had enjoyoed the ovee.